This is a Vegan appetizer that would impressed anyone. The freshness of the coconut meat, the crispiness of the hearts of palm and the sweetness of the mango makes a perfect combination of flavors and textures. 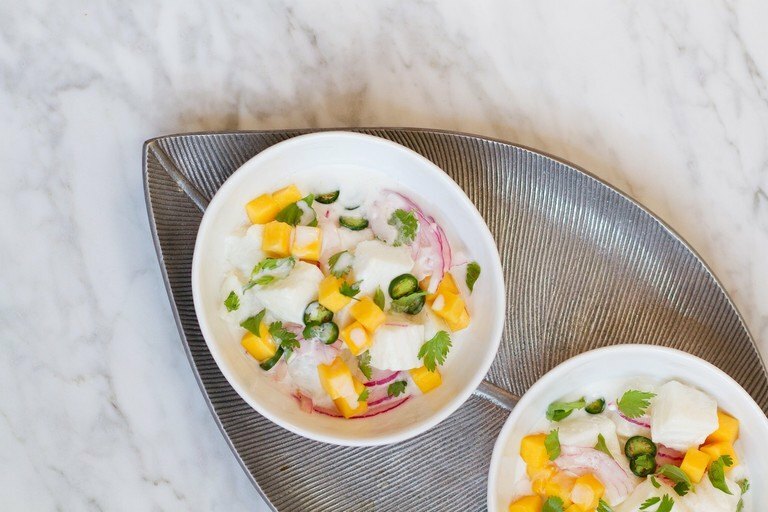 Growing up in Peru, I learned the secrets of how to make a traditional Fish Ceviche with its white milky juice called “Leche de Tigre” witch means in English “Tiger’s Milk”. Leche de Tigre is the leftover flavorful juice in which the raw fish gets marinated and most people drink it afterwards. In this Vegan recipe you will have almost the same effect after combining the lime juice, garlic, aji panca, ginger, salt and coconut milk. Even thought there’s no fish to marinate, you still want to soak the coconut meat for a few minutes so it absorbs all the flavors. To create a beautiful presentation when serving this dish. You can use a martini glass or a square dish. Garnish it with mint or cilantro and the sliced avocado. Lime marinated young coconut meat with hearts of palm and sweet mango. Combine the coconut meat, mango, sliced hearts of palm, mint, red bell peppers in a bowl and mix until well incorporated. Add “Leche de Tigre” to salad and toss until it is well incorporated. To create a beautiful presentation when serving this dish. You can use a martini glass or a square dish. Garnish it with mint or cilantro and the sliced avocado.